We call it a passion! FANUC is the global leader in factory automation, providing high-tech products and specialised services. Maintaining its leading position, FANUC is fast paced and thrives on progress and a working environment that is constantly evolving. As a result, members of the FANUC team need to be both flexible and adaptable. In return FANUC offers a diverse and dynamic corporate culture and an employment policy that fosters open structures, flexible working and great career opportunities. Employee development is key to our personnel strategy. Some call it a job; we call it a passion! FANUC is looking for ambitious, team spirited people who like to work independently and speak their minds. We are competitive and demanding but always reward performance. At FANUC career development is about personal progress. That's why we do not look for superstars from day one, but indentify and promote talent. FANUC is deeply committed to maintaining a healthy, social and environmentally friendly workplace. This is reflected in our organisational culture, work environment and code of conduct – our guide to sustaining high ethical standards and fostering an environment in which respect and integrity are self-evident – and felt in our wellbeing. Fostering a healthy balance between work and home life is a key component of FANUC HR policy. We believe that happy employees are productive employees. That's why we offer flexible working hours, additional health care benefits as well as activities intended to provide more balance and reward our hard-working personnel. To support our service engineers and technical support teams, we are constantly looking for committed people we can entrust with the demanding task of promoting FANUC's unique products and customised automation solutions to a range of clients. 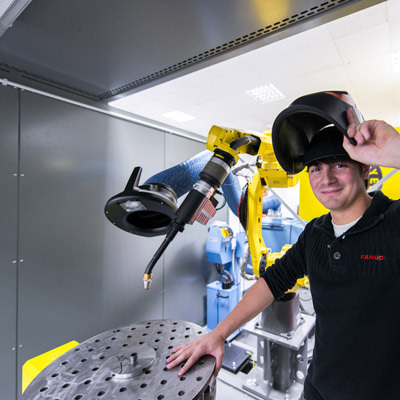 FANUC is keen to welcome young ambitious people to the team. Looking for a career in a fast-paced, international technological environment? Join us now by completing an apprenticeship! Since our structure and work ethic is designed to recognise the individual, this also determines our choice of employee. FANUC is looking for individuals not just numbers. Show us your talent and be part of the success story!